Another overcast day and another trip to an excellent south facing crag. 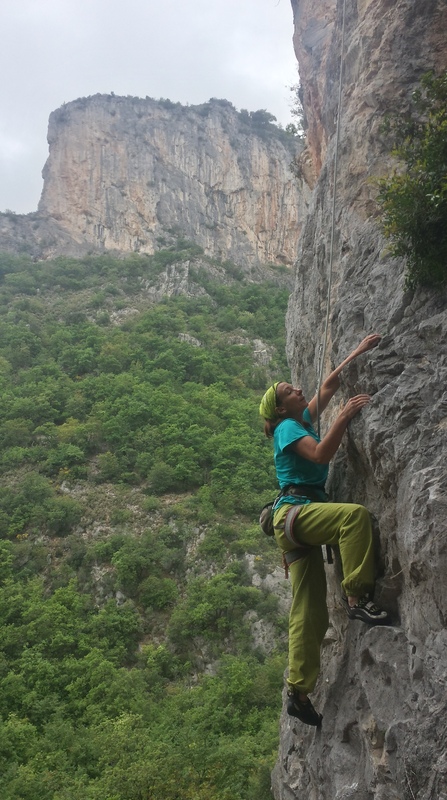 I Gumbi (not to be confused with the Yorkshire crag of Eh by Gumbi 🙂 ) is lower down in the same valley as Paretone – more 3* fun on slightly overhanging orange limestone with sharp crimpy holds and tufa blobs. Sadly that’s our last day in Oltre Finale – we’ve had a really brilliant time here. Outstanding climbing on 8 different crags (out of about 60, we’ve barely scratched the surface! ) in a really beautiful setting. Plenty of options for all weather conditions and we didn’t even get around to exploring the high altitude cragging at the top of the valley around 1400m. We’ll certainly be back! Then we’re back on the autostrada heading north via Turin into balmy evening temperatures of near 30C before an overnight stop at a friendly but disappointing campsite, waking to rain which soon turns to snow as we head through the Alps to the Frejus tunnel. What a difference in 12 hours!